There was a time when 12 people on stage in The Polyphonic Spree or the 19 members in Broken Social Scene was the norm... even Arcade Fire toured with 9. Maybe it was an attempt to spread around vocal duties or shift the attention away from the idea of a frontman, but you could easily have made a few cuts in the lineup and it wouldn't really have changed the sound. Instead of making a political statement however, both sides of this split on Electric Cowbell Records absolutely need every one of their members to create this full orchestral funk sound. Super Hi fi on the A-Side does "We Will Begin Again" which takes them back to their minimal guitar sound heard on the "Single Payer" single and that slow jazz alternaitng rim shot. The brass is subdued here in its own sonic space, acting more to fill in the atmosphere until this changes into chorus. An overall lounge sound, the swirls of electronics and high reverb guitar melody lulls you into thinking about a nap. Those horns will wake you up though. There's no kind of lullaby like this slow dub sound. The percussion works the hardest while they start to slow and fade, the combination ultra fast high hat hits and rim shots filling the void. A far off siren drives by the studio while the whole thing picks up and is fed through a bank of speakers underwater, barely struggling and sinking to the bottom. 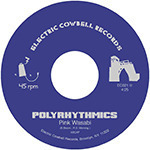 The B-Side finds The Polyrhythmics track, "Pink Wasabi" with a great percussive guitar sound, a real weird string scratch is the starting place for this similar brass groove. The guitar isn't as rigid in Super Hi-fi, here it's full of phaser effects and free to roam outside the chk chk structure. And the flute? This is a great touch, a real weight it lifted here. Where Super Hi-Fi felt more concerned with building tension, this feels celebratory and free, they are unconsciously expressing a sense of joy and cooperation, there's no hierarchy in this well spirited jam. Organ, flute... there's plenty of directions to go and they'll all get their chance here. Feels like there's a lot more up their sleeve than this four minutes.